Kanye West has granted his platinum-plated cosign to Daft Punk, Can, and Bon Iver, among other once-unlikely hip-hop touchstones — King Crimson, hanh? When the pungent smoke clears from West’s new G.O.O.D. 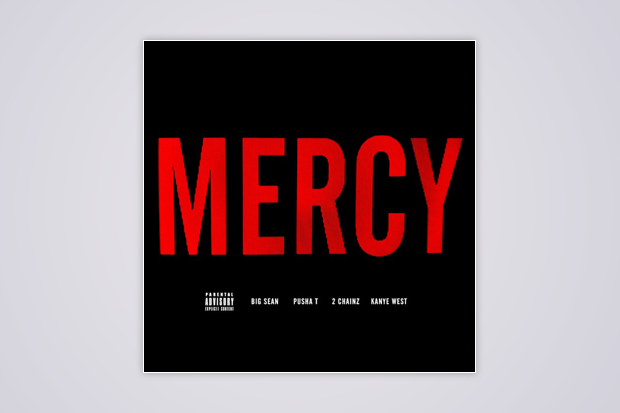 music single, “Mercy,” featuring Big Sean, Pusha T, and 2 Chainz, the big winner might be another artist previously little-known to a mass audience: Warp Records’ Scottish electronic producer Ross Birchard, a.k.a. Hudson Mohawke. Fact reports that HudMo, last seen remixing laser-guided post-rock pummelers Battles, contributes “additional instruments” to the track. But first, the track, which stays firmly in each contributor’s lane. G.O.O.D. Music newcomer Lifted produces, overseeing thudding sub-bass and a one-finger synth riff that will not sound out of place next to the hypnotic sneer of “Niggas in Paris” or this week’s previous West-DJ Khaled collaboration “Theraflu.” Between a chopped and screwed-style hook, Big Sean sticks to rapping about A$$, Pusha T enthuses about the coke game with his usual remarkable word selection, and Kanye boasts forcefully about money, taste, and publicity. 2 Chainz brings it all back home with some stinging Dirty South straight talk (“All my cars is foreign / All my broads is foreign”). The most attractive section of the song, though, and the one most reminiscent of a Hudson Mohawke record, is Yeezy’s verse, where the music swerves into an ever-ascending sci-fi pulse. With each rapper offering a proven commodity here, and the beat neatly within the realm of recent chart hits (though that dancehall-tinged vocal at the end of the hook is an ear-catching twist), “Mercy” looks bound to be a hit, if not one that tells us much we didn’t know about the guys who made it. HudMo’s sweet, pillowy electronic music has long sounded radio-ready, particularly on last year’s excellent Satin Panthers EP, and he has collaborated with Chris Brown, Just Blaze, and Tinie Tempah, among others, so his presence here isn’t totally out of left field, either. But it’s yet another reason to have a good Friday. When the SoundCloud embed above inevitably gets taken down, listen here. Or just purchase here.